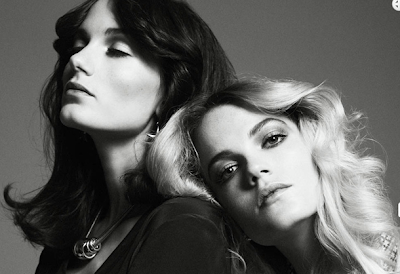 Penny Lane: Say Lou Lou cover Tame Impala's "Feels Like We Only Go Backwards"
Say Lou Lou cover Tame Impala's "Feels Like We Only Go Backwards"
Say Lou Lou aka twins Elektra and Miranda Kilby have handled the super popular “Feels Like We Only Go Backwards” with much respect. Their cover focuses more on the track’s clever lyrics and atmospheric sound than the psychedelic back work. A good decision on their part as it suits the moody slow burn of the duo. For starters, they kick off with the verse (rather than chorus as in the original) and a slower tempo which allows for more audible layering. Despite the slow, whispery delivery their cover is by no means quiet. “It’s like there are several different worlds inside one song,” they wrote of the original. They’ve got the changing dynamics covered. And what Say Lou Lou has added are these light feminine vocals in the back (no drama in recording overlay when you’re twins), which bring lyrics to the fore. “We’ve always loved Tame impala, not only because they’re a fantastic Australian band, but because it also hints at music we listened to growing up. There is something sweetly familiar and nostalgic about the music, yet still fresh and innovative.